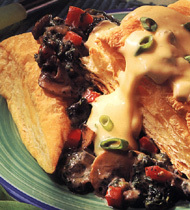 Try our Mushroom and Spinach Strata made with Pepperidge Farm® Puff Pastry Squares and Campbell's® Condensed Cream of Mushroom Soup. This delicious recipe is a great substitute for Spanakopita or other finger foods on your menu! 1 Cut each pastry square in half to form 2 triangles. 2 To make filling: In large braising pan in hot margarine over medium-high heat, cook mushrooms until liquid evaporates. 3 Add onions, peppers, garlic and sherry. Cook until liquid is reduced by half. 4 Add spinach, soup, milk and pepper. CCP: Heat to 140º F. or higher for 15 seconds, stirring constantly. 5 To make sauce: In saucepot mix soup, half-and-half and sherry. Heat through, stirring often. 6 Add cheese and onions. CCP: Heat to 140º F. or higher for 15 seconds, and until cheese is melted, stirring constantly. 7. CCP: Hold filling and sauce at 140º F. or higher. Portion filling using 6-oz. ladle (3/4 cup) over one puff pastry triangle. Cover with another triangle. Ladle sauce using 2-oz. ladle (1/4 cup) over pastry. 1. Cut each pastry square in half to form 2 triangles. 2. To make filling: In large braising pan in hot margarine over medium-high heat, cook mushrooms until liquid evaporates. 3. Add onions, peppers, garlic and sherry. Cook until liquid is reduced by half. 4. Add spinach, soup, milk and pepper. CCP: Heat to 140º F. or higher for 15 seconds, stirring constantly. 5. To make sauce: In saucepot mix soup, half-and-half and sherry. Heat through, stirring often. 6. Add cheese and onions. CCP: Heat to 140º F. or higher for 15 seconds, and until cheese is melted, stirring constantly.